John Williams, southeastern fisheries district program manager for the Kentucky Department of Fish and Wildlife Resources, holds a huge smallmouth bass he caught from Laurel River Lake in late fall. This is the second installment of a series of articles titled "Fall Fishing Festival" profiling the productive fishing on Kentucky's lakes, rivers and streams in fall. You arrive at the Holcomb’s LandingRamp just after dawn and look at the shoreline of Lake Cumberland. A line ofdamp rocks several inches thick rings the lake and the rip rap on the face ofWolf Creek Dam. Your heart sinks. They arereleasing a lot of water quickly through the dam and into the Cumberland Riverbelow it. 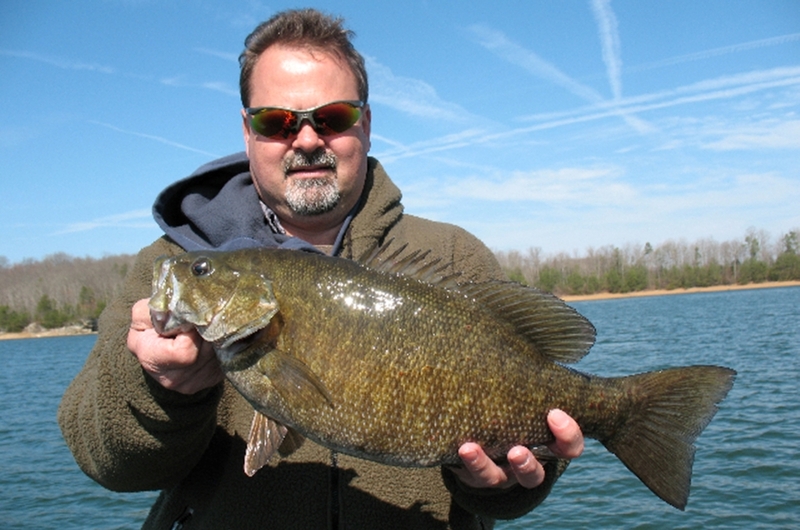 The first smallmouth bass trip of the fall may be a bust. Falling water, along with the fallturnover and cold fronts, are challenges in decoding fall bass fishingpatterns. Falling water is a common situation found in fall as many lakesacross Kentucky experience significant drawdown to winter pool. Most large reservoirs in Kentucky beginthe fall drawdown in the middle of October, but others start in late Septemberwhile a few begin in November. Williams said he noticed the flatnature of the upper ends of creek arms during the drawdown of Lake Cumberlandfor repairs on Wolf Creek Dam. “Dam releases pull water and baitfish off thoseflats and back into the channel or along steeper banks,” he said. This pulling effect scatters thebaitfish, but they relocate and suspend over long points, channel ledges orunderwater humps near the mouth of coves or creek arms. The bass follow. Shad-colored, deep-running crankbaitsand suspending jerkbaits fished near these structures work well. Mentally notethe location of the first bass of the day and use the same presentation in asimilar area on other parts of the lake. As the fall winds blow ever colderair over the surface of Kentucky reservoirs, the top layer of water cools andbegins mixing with the chillier, denser water underneath. The thermal layeringof the water column formed during the heat of summer breaks up. Eventually, thewater’s surface layer is the same temperature and density as the water underit, a phenomenon commonly known as turnover. Williams explained the shallowercreek arms and the upper reaches of the lake turn over before the deeper mainlake. “The whole water column has to cool down to match the bottom level. Inour deep lakes like Laurel River and Cumberland, the full turnover isn’tcomplete until November and into December,” he said. On shallower lakes like BarrenRiver Lake, the turnover is almost finished. The Louisville District of theU.S. Army Corps of Engineers’ website has a graph of the dissolved oxygen profilefor all of the lakes in its district including Barren River, Buckhorn, CarrCreek, Cave Run, Green River, Nolin River, Rough River and Taylorsville. Fromthe homepage, click on the “Water Information” tab and the “Updated LakeTemperatures and Dissolved Oxygen Levels” tab. After you arrive at the water andnotice off-colored water with a smell, fish another section of the lake. If youare near the dam, the upper lake and major creek arms have likely turned over.If you are in a major creek arm or upper lake, the deeper water at the damprobably hasn't turned over yet. Minor cold fronts actually can helpfishing in early fall. Bass feed heavily in the days leading up to the frontand a small deep-running chrome crankbait draws strikes. After the minor frontpasses, baitfish school a bit more and settle a little deeper, but bass stillhit. The drop shot technique using a 3 ½-inch soft plastic jerkbait in the sexyshad color can work wonders in this situation. A major cold front, especiallylater in fall, that drops the lake temperature several degrees means tough, butnot impossible, fishing. Anglers must downsize their lure size, use lighterline and fish much slower. A 4-inch black finesse worm riggedon a 3/16-ounce small Shakey head and fished in the “dead stick” presentationmay save the day. Simply cast to the point, channel ledge or hump and let therig sink to the bottom. Reel in the slack, keep a tight line and squeeze therod handle to impart a subtle action to the worm. Grumpy bass that passed byall other offerings often succumb to this. Get out this fall and overcome someof these challenging situations. Fall brings great weather and deserted lakes,perfect conditions for bass fishing. Editor’s Note: AuthorLee McClellan is a nationally award-winning associate editor for KentuckyAfield magazine, the official publication of the Kentucky Department of Fishand Wildlife Resources. He is a life-long hunter and angler, with a passion forsmallmouth bass fishing.